The General Office, Room 250, is open throughout the academic year from 9:00 a.m. to 4:45 p.m.
Summer hours are: 9:00 a.m. to 4:15 p.m. Faculty members are usually here on class days. You can contact them by directory or leave a note in their mailboxes in the General Office giving your name, email, a telephone number and when you can be reached. It is our firm policy not to give out your address or telephone number to anyone outside the faculty who requests this information. A caller is asked to write to you in care of the faculty, or the caller may leave a telephone number and message which will be placed in your mailbox. No student can be reached by telephone by an outside caller except in emergencies. If you expect a call you should let the General Office know where you can be reached. Please see Kay Ramdass, Room 250, or call (416-978-3266) to book rooms at the Faculty for planned events. For local calls, a phone is provided free of charge in the MSW Computer Lab on the 7th Floor, Room 724. Press 9 for the outside line. Personal belongings should never be left unattended and students are requested to inform the General Office staff immediately if anything suspicious occurs. If you find articles, please turn them in at the counter in the Faculty’s General Office. Bulletin boards throughout the Factor-Inwentash Faculty of Social Work have been assigned for specific groups or areas of study. Bulletin boards available for postings by students other than the specific groups identified on each board are located in the Student Mailroom (Room 200) and in the Student Lounge (Room 320). A special same-day bulletin board is available immediately outside of the Student Mailroom for notices of events occurring on that day. Postings on the glass doors of the main entrance to the building are prohibited. Materials posted without faculty consent will be removed immediately. The Accessibility for Ontarians with Disabilities Act (AODA) was passed by the Ontario Government, Ministry of Community, and Social Services; with the goal of establishing a “fully accessible” Ontario by 2025. The Customer Service Standard is the first of five Standards to become law. All Ontario Universities must comply with the Customer Service Standard by January 1, 2010. A requirement of the Customer Service Standard is to provide information to all employees regarding the delivery of service. For the University the legislation applies to everyone who interacts with a student, future student, or member of the public. Please review the brochure with information regarding best delivery of service to persons with disabilities and additional information to support persons with disabilities in our community. Please also visit www.aoda.utoronto.ca for more information. 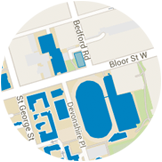 As per university policies outlined in the links above, the use of space for temporary purposes will be limited to groups which have a formal standing either as a student society or a recognized campus group at the University of Toronto. The procedures indicate that “Individuals and individual members of the University community may not book academic facilities for private use.” The official source of information that outlines which groups have formal standing is http://ulife.utoronto.ca. Information about the process to seek recognition is also available at this site.